In its early stages, chronic kidney disease can lurk silently in the body, causing no symptoms at all. Eventually, as these vital organs fail, the hands and feet start to puff up, and sufferers feel nauseated, achy, and itchy. When the disease reaches its last stage, the kidneys fail and you can die. Around 2000, health officials noticed that chronic kidney disease was on the rise in Central America. An epidemic seemed to be raging among farmworkers who toiled in sugarcane fields on the Pacific Coast in El Salvador and Costa Rica — one of the hottest areas in the region. To date, more than 20,000 people have died in the epidemic, and thousands of others have had to go on kidney dialysis to survive. Roberto Lucchini, an environmental and public health professor at Mount Sinai, who’s been studying the phenomenon, calls this the first epidemic that’s directly attributable to climate change. “It was not recognized before the rise in temperatures,” he said, “and the epidemic of these cases is currently observed in the countries that are more affected by [global warming] in the last decades,” from Central America to India and Southeast Asia. The epidemic might also be happening closer to home. Recent studies focused on California and Florida suggest the disease may already be afflicting people who work outdoors in the southern US too. The basic idea: When people are exposed to long stretches of extreme heat, they sweat more. If they don’t rehydrate, or don’t have access to clean drinking water, the kidneys, which are supposed to filter waste and regulate fluid in the body, get stressed. Over time, that stress can lead to kidney stones and chronic damage. “The hypothesis is that weeks and months of sustained, acute kidney injury [due to heat exposure] could potentially destroy the kidneys’ ability to function,” said Linda McCauley, dean of the nursing school at Emory University, who has been studying kidney failure among farmworkers in Florida. Another possibility is that that the workers have been exposed to an environmental toxin, like a pesticide, though none have been identified yet. “The deaths are occurring. We haven’t found any of the known suspected agents that we know can damage kidneys,” added McCauley. According to McCauley, it’s not that far-fetched to think that as temperatures continue to rise and record-setting hot days multiply, the risk of kidney problems — especially among vulnerable populations, like outdoor workers and the elderly — is only going to grow. But there are a number of things that can stress the kidneys’ ability to function. The most well-known contributors to chronic kidney disease are other chronic illnesses, like diabetes and high blood pressure. Around the world, as diabetes and high blood pressure have become more common, so has chronic kidney disease. When researchers discovered farmworkers in Central America who didn’t have these underlying conditions had developed chronic kidney disease, they became curious. “It was first noticed in El Salvador, where along the coast, people were getting kidney disease and being referred to the main hospital with kidney failure,” said Richard Johnson, a kidney disease expert and professor of medicine at the University of Colorado. “The wards were filling up with people with chronic kidney disease or end-stage kidney failure, and these people didn’t have the typical causes of kidney failure,” like high blood pressure or diabetes. They were often in their 30s and 40s, and seemingly otherwise healthy. An initial investigation showed many of the afflicted had been working outside, particularly in sugarcane fields, where temperatures can surpass 82 degrees Fahrenheit by midmorning. The locations of the kidney disease epidemic on the Pacific Coast overlapped with areas in the region that have seen some of the most dramatic rises in average daily temperatures since the 1940s. There was (and still is) speculation about whether other factors — chemicals from pesticides, for example — were driving the increase. But when health officials started to spot similar trends in Sri Lanka and India — other areas that have become significantly hotter on average — they began to explore climate change as a contributing factor. A group of climate researchers, also at the University of Colorado Boulder, investigated, and discovered that these kidney disease epidemics were more likely to occur in places with rapidly rising temperatures, longer and more frequent heat waves, and less rainfall. In one epidemic site on the Pacific Coast, Costa Rica’s Guanacaste province, for example, the prevalence of Mesoamerican nephropathy is believed to have increased almost tenfold in men and fourfold in women since the 1970s. The Central America data prompted researchers in the US to examine whether extreme heat is affecting kidney function in outdoor workers here. For the “Girasoles (Sunflower) Study,” published in May 2018 in the Journal of Occupational and Environmental Medicine, McCauley of Emory and her co-authors looked at the hydration status and kidney function of 192 Florida agricultural workers, most of whom picked field crops and hailed from Mexico. They found that more than half (52 percent) showed up at work already dehydrated — perhaps because of a hot commute to work or not drinking enough water when they woke up. By the end of a shift, that number rose to 81 percent. And a third of the workers had endured at least one episode of acute kidney injury — a sudden decrease in kidney function that happens over a few hours or a few days — on a workday. Meanwhile, the odds of acute kidney injury increased by 47 percent for every 5-degree rise in the heat index in Florida. So people in the study were more likely to experience acute kidney injuries on hotter days. It didn’t help, McCauley said, that workers sometimes delay going to the bathroom because it means pausing work and losing wages. So social circumstances, and the lack of worker safety protection, made workers more vulnerable to weather extremes. Researchers at the University of California Davis who have been studying heat trends identified similar risks in California. For a 2016 study, part of the California Heat Illness Prevention project, they looked at 295 agricultural workers and found 12 percent had experienced acute kidney injury over the course of one day at work. Other vulnerable populations may also be at risk. In a 2014 study of hospital admissions among adults ages 65 and older during extreme heat events — defined as two or more consecutive days of uncharacteristically hot temperatures — researchers found the risk of kidney failure was higher on heat wave days compared to non–heat wave days. Dehydration from heat also puts the kidneys at an increased risk of forming painful stones — and there’s another climate-related kidney hypothesis floating around: that the incidence of kidney stones may soon increase in parallel with rising global temperatures. So the more a person sweats, and forgets to rehydrate, the more likely they are to form kidney stones. 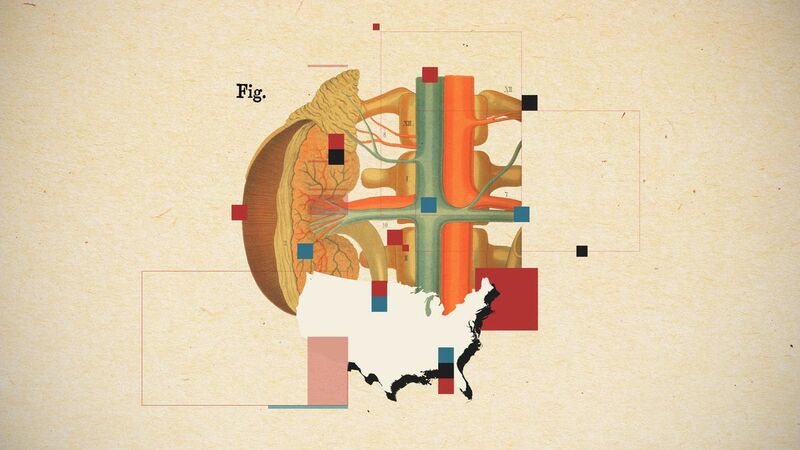 Kidney stones are common in the southeastern part of the country, an area that’s known as the “kidney stone belt.” (The prevalence there is 50 percent higher than in the Northwest.) Part of this is driven by the epidemic of cardiovascular disease and metabolic problems — such as diabetes and obesity — in the South. But heat, as we’ve discussed, is believed to be a contributing factor. And as the temperatures rise across the country, some researchers expect the problem will worsen in the South and spread north through the US. 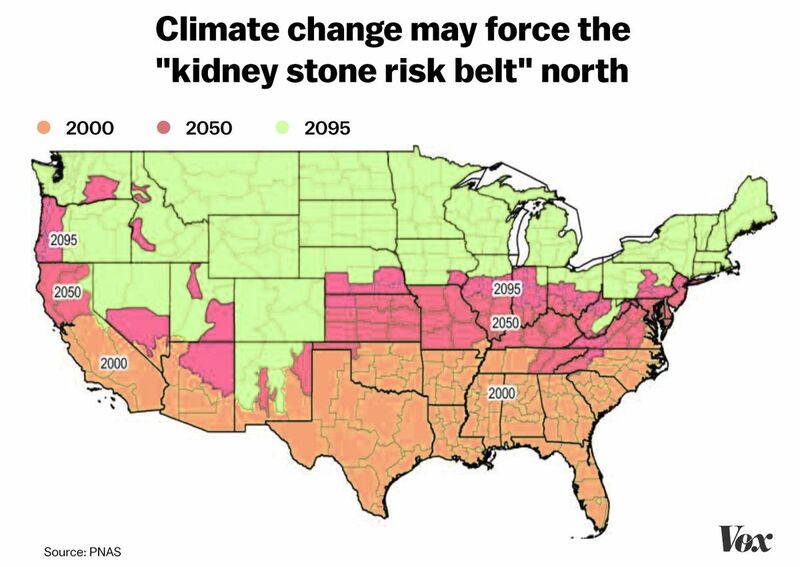 In a 2008 paper published in PNAS, researchers at the University of Texas used climate prediction models produced by the Intergovernmental Panel on Climate Change and showed that as temperatures in the US increase, the US kidney stone belt is going to expand north. The greatest increases in stones will be in some of the areas most affected by warming — California, Texas, Florida, the eastern United States, and the stretch of land from Kansas to Kentucky. But altogether, climate-related kidney stones cases in the US will increase 30 percent by 2050, the researchers predicted, from 1.6 million cases to 2.2 million. By that time, 70 percent of Americans are projected to live in high-risk kidney stone areas, compared to 40 percent in 2000. Kidney stone disease is already on the rise in the US, even among children. According to the National Health and Nutrition Examination Survey, the kidney stone prevalence was 5.2 percent in the mid-1970s. By 2010, it had increased to 8.8 percent (11 percent among men and 7 percent among women). Again, that’s thought to be because other chronic diseases have become so prevalent. Hot days are already a risk factor for stones. In one 2014 study, a group of researchers in Philadelphia showed that hot days — when the average daily temperatures rose to 30 degrees Celsius — were associated with a relative risk increase for stones compared to cooler days (below 10 degrees Celsius) in five US cities. But climate change might soon make the problem worse.